What we can learn from Radiohead & cooking scallops. There is something I have been wrestling with on a project lately. It is a good problem to have actually. An abundance of riches. The problem is that the project features lots of amazing guest musicians, and we have situations where a guest will come in and play an amazing part on one section of a song, and then another musician will come in and play a different amazing part in the same section and that is even before we have recorded the lead vocals. How could all this great stuff be a problem? This is the dilemma we are having in the studio on my current project. We have all these times when the guest musicians that are playing on the album were so great that we were literally jumping for joy at what they had brought to the album, but then when I am mixing it all together I have lost some of that euphoria. Had I gotten caught up in the excitement of the moment of tracking and misjudged the quality of the parts they all played? Absolutely not! The parts were amazing! All of them are amazing! What is happening is that when we had one great part, and then added another awesome part on top of it, the new part is starting to smear the detail and phrasing of the first part. It diminishes our connection to the first part. Beyond the core instruments in an arrangement, every time you add an element to the mix you start to rob the listener of experiencing some interest and detail of the other parts. One way is not better than the other, but you have probably noticed this in your own work those times when you found that killer synth patch for a track but after you added more synths and guitars, you lost the excitement you had about that first killer synth patch. They way we are dealing with this in my current production is taking the “OK Computer” approach (and the same approach used on countless amazing albums for decades). If you listen to Radiohead’s landmark album, OK Computer, it feels like you are swimming in a sea of amazing sounds. There is so much stuff going on and all the sounds are so cool!!! ….. the second half of that previous sentence is true but not the first part. That album is full of amazing cool sounds, but it is actually a sparse production. When Radiohead has a really interesting sound or riff, they will play it for a while, but when they introduce something else super cool, the previous cool thing will usually stop. They do this trick constantly. That way, all of the cool interesting sounds are not having to fight through layers to be heard or experienced. The cool stuff is served in a series of courses, giving each flavor a chance to shine. 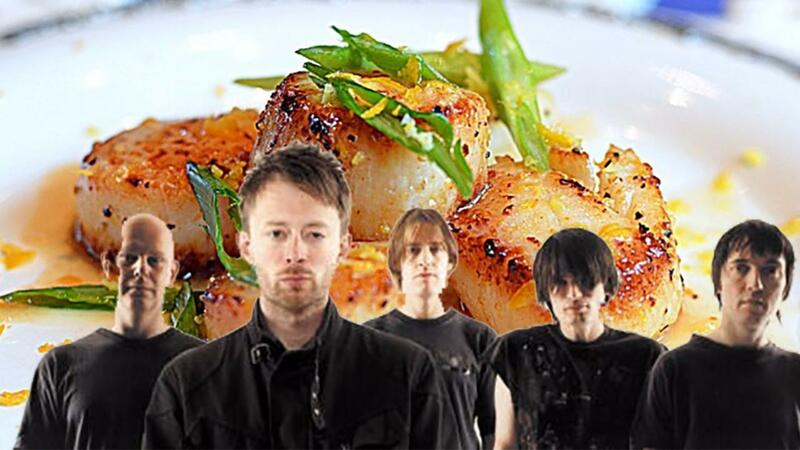 Radiohead is serving the scallops with a light garlic butter, before bringing out the roast pork. Upcoming Events as soon as next week!